Call it persistence or call it foolishness, but we’ve been at this for 15 years. It was the first week in September of 2001 that 15 Bytes put together some basic html, a bunch of words and some small jpeg images and posted its first edition online. Earlier that summer, at the booth I had at the Sugar House Arts Festival, I put out an announcement about my intention to create an online forum for Utah artists. Not being a native Utahn, or having attended one of the local art programs, I wanted to know how people in the art community connected. I collected about 30 emails that day, talked to a couple of people who said they might want to contribute material, and decided to take the plunge. I asked a couple of friends — Aaron Moffett, a collector, and Nancy Thunell, an arts professional — to help me draft the required paperwork, and Artists of Utah was born. That first edition was really about my neighborhood, the things happening around me. There was an article on Darryl Erdmann’s Chroma Gallery in Sugar House, a place I hung out at frequently; a couple of reviews at the (old) downtown library, and a piece on an art fund-raiser I participated in. The next month we added our Artist Profile feature with an article on Jeff Hein, a recent graduate of the University of Utah whom I met at a group exhibit I was involved in. In the past 15 years, that neighborhood has grown to include the entire state of Utah. This month’s edition features artists from Logan, Torrey, Provo, Sundance and Salt Lake City, along with events happening in Ogden, Leeds and Cedar City. And it has become an inclusive art neighborhood that includes music, theater, dance and literature. We mark anniversaries for various reasons (there’s also the excuse for a party) and one of those is the need to reflect. So, looking back at a decade and a half, we’ve had the chance to consider some lessons learned. Set up the funding first. The artist side of me has never been particularly good about planning ahead. You get excited about something, you do it. You figure out how to pay for it later. Which is what happened that first week of September 2001. There was no funding. Just a clunky desktop computer, a dial-up connection and an artist with some time on his hands (I had no children then). Had all the appropriate funding been set up ahead of time, I might have avoided lots of headaches over the years, including more than one embarrassing fundraising plea (our most successful fundraiser plea? A photo of a disheveled me on the side of the highway with a sign that read “will edit ezine for food”). But the truth of the matter is, funding would have been hard to come by. The Internet was young: Mark Zuckerberg was still in high school, Google hadn’t yet taken over the world and Netscape was still the dominant web browser. When we told people we were starting an online magazine, they didn’t quite get it. And, since we didn’t fit any of their already established formats, granting organizations had no idea what to do with us. But after a couple of years, when people had a chance to see what we were about, the money began to come in. Even if at a trickle. 15 Bytes is still here today because individual members of the community (many of them underpaid artists), decided what we do is worth it. To these contributions we eventually added grants from private foundations (support from the Doctorow Foundation in our early years was crucial) and public entities like ZAP and local arts councils. So, maybe the lesson isn’t so much to set up the money first as to do something that matters. One thing we did get right at the beginning was to go digital. Over the years we’ve been urged to come out in print, and even experimented ourselves with what a print edition might look like. But as we’ve watched various print publications related to the arts in Utah emerge and inevitably fold — after two issues or two years — we’ve been reassured that digital was the right answer. It’s quick and flexible—any number of our articles were written the night (or morning) before publication. It reaches the greatest number of people—no distribution worries and little harm to the environment. And — no small benefit to a publication about the visual arts —being online gives you the freedom to publish as many images as you like at no extra cost. It also works great for video, and we became one of the earliest media outlets in the state to produce video content on the arts. Another thing we got right is that it takes a village. From the outset, we organized 15 Bytes as a community forum. The lack of funds to pay writers made it a necessity, but it was also an important editorial choice. Instead of a single editorial voice reflecting parochial interests, we wanted the publication to be open to the community, to reflect the enthusiasms and interests of a broad range of people. Anyone who doesn’t think their interests or community is represented in here just needs take up a pen (or laptop) and write. And that village has been fantastic. And continually evolving. Naming a few risks offending many, but some of the people who have helped make 15 Bytes what it is should be noted. Laura Durham contacted us after the first edition, wrote for the second and has been helping out ever since (she’s currently our music editor). Steve Coray, who appears in this edition after a long hiatus, was crucial in the formative years, providing content, experience, and some pertinent existential questions. For years, Geoff Wichert and Ehren Clark did most of the heavy lifting on reviewing shows, a thankless task in a small town/state. Tom Alder came along with his column on historical Utah artists, John Hughes with his on hints and tips for plein air painters, and Sue Martin with her series of articles examining process. They all at least got a byline, but others, helping with the nitty-gritty behind the scenes, often went unrecognized — Terrece Beesley, who until just this month has edited our Mixed Media feature, Jared Christensen, who began as a college intern and continued doing much of the grunt work after graduation, and Carol Fulton, who painstakingly read the editions for errors. When Ann Poore came onboard as a writer but also as a copy editor, she brought years of experience in journalism and an insistence that we be consistent (who knew there was such a thing as a style guide). Our photographers — Simon Blundell, Zoe Rodriguez, Shalee Cooper, Kelly Green, Portia Snow, Will Thompson, just to name some of the regulars — have given the magazine its visual pizazz. The late Sarah Thompson initiated our coverage of dance, and Dale Thompson (no relation), who came onboard as part of her master’s thesis in Communications at Westminster College, helped build on Sarah’s work to broaden the horizons of our coverage. Ashley Anderson and David Pace continue that expansion with their editorial management of dance and literature. Many of these individuals are still with us, joined by dozens more who help out on a regular or irregular basis. We’ve decided over the years that it’s more important to mean a lot to a minority than to mean a little to the majority, which is why, in an era of sound bytes and tweets, our purpose is to allow these contributors to discuss the arts in a meaningful and in-depth manner. 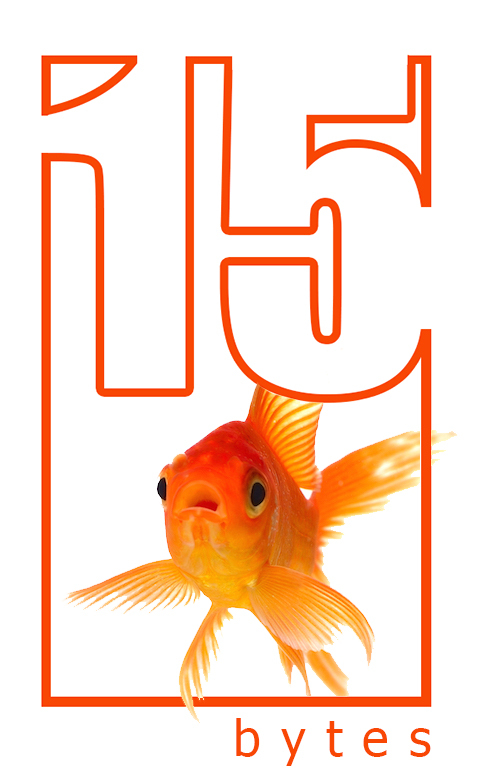 We’ve always tried to make our next edition our best, and we think you’ll find this special 15-page anniversary edition of 15 Bytes is certainly one of our best achievements (just don’t expect us to try to top it any time soon). All of the contributors over the years have been very important to the product. All helped in some way to evolve Shawn’s original, raw vision. Lots came and went (like me). A few made significant, consistent contributions. Some brought in new ideas. But without Shawn Rossiter’s vision, intelligence and stubborn persistence, AoU would have folded LONG ago. And many times over the months and years. Kudos, Shawn. Maybe you ARE just that cool. (Wow, that is painful to admit.) Kudos too to Patricia for being the ever-supportive wife of the organizer of an untested non-profit venture. So happy anniversary! I hope I am around in 15 years to see where you have taken Artists of Utah and 15 Bytes by then! Wherever it is, it will be thought-provoking and informative. I’m happy to be a part of such a great magazine. Cheers to 15 Bytes and Artists of Utah!